Sometimes the best things in life are free. This is a good thing, especially when you’re broke! Here are 17 free date night ideas for you to try. 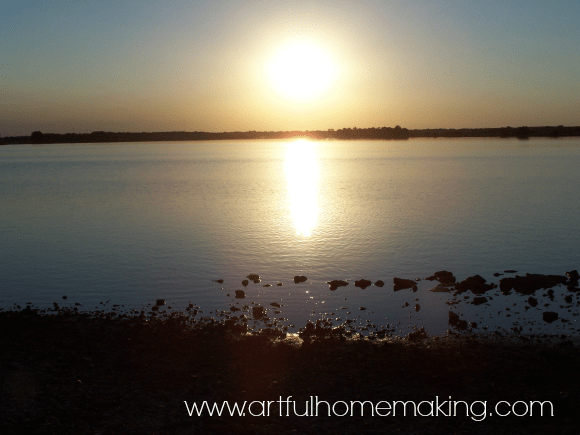 This is the eighth post in my 31 Days of Living on Less Series. If you’d like to read all the posts in order, go to Day 1. 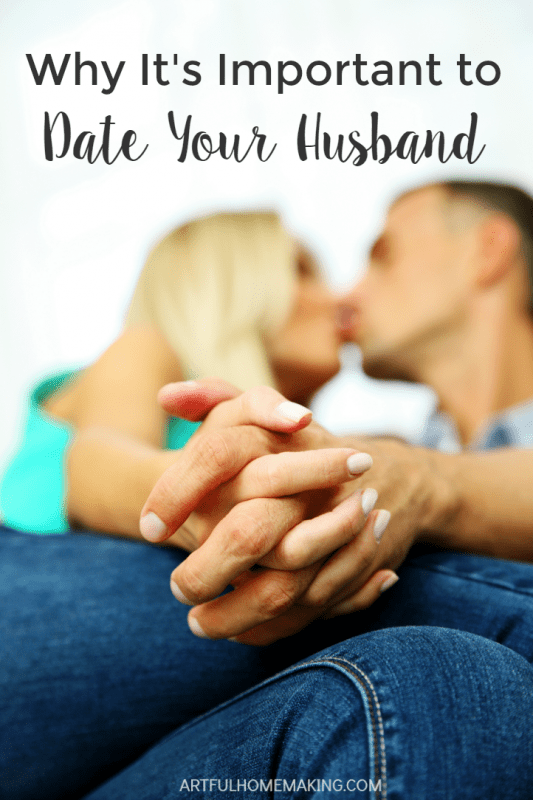 My husband and I have been dating for almost twenty years. We’ve been to movies, plays, musicals, ballets, concerts, symphonies, parks, theme parks, special events, romantic restaurants, and fast food joints. And I’ve enjoyed all of these times together. But sometimes it’s the simplest dates that have the biggest impact on our relationship. Last summer, we had one of the best dates. It was simple, and it was free. We brought homemade sandwiches to a nearby conservation area. Then we found a secluded place that just happened to have a picnic table by the water’s edge. We ate our sandwiches and talked and mostly just reveled in the silence (if you’re a parent, you’ll understand). We had been under a great deal of stress (which kind of seems to be the story of our lives for the past few years, now that I think of it! ), and we were just craving a bit of time to unwind together. 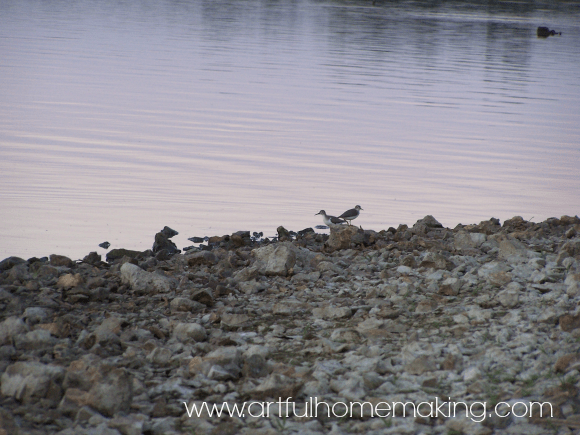 After eating, we sat by the water’s edge, watching the birds search for insects among the rocks. 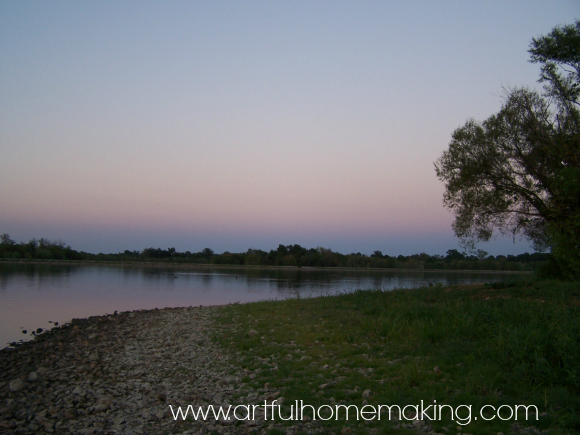 We watched the dragonflies swooping across the sky, catching mosquitoes. 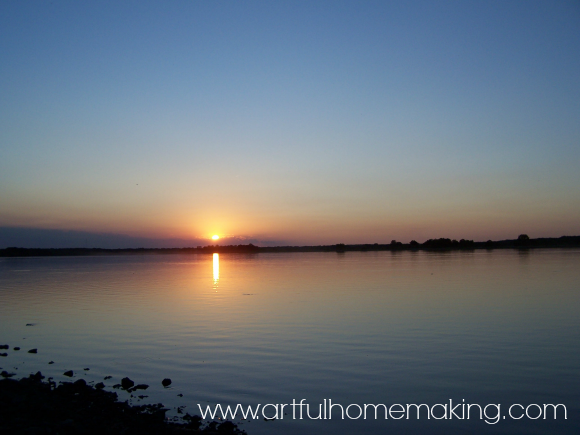 It was so quiet that you could hear the water gently lapping against the rocks as the sun sank lower and lower in the sky. We both felt a sense of deep peace and contentment wash over our souls. It was utterly and breathtakingly beautiful. And it didn’t cost a fortune to enjoy this extravagant beauty. 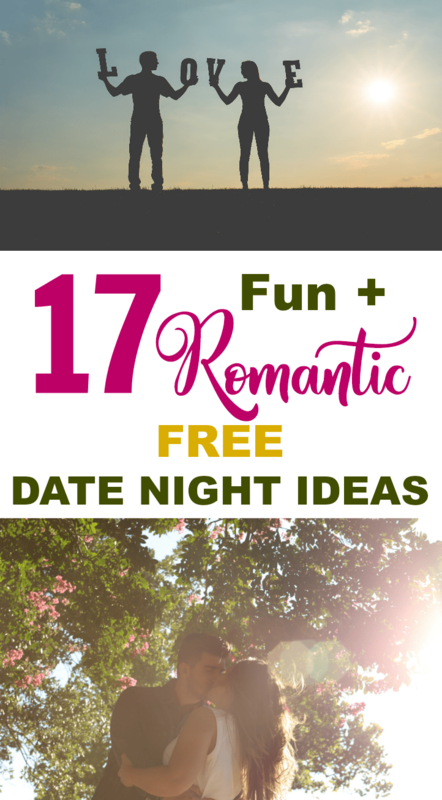 Need some free date night ideas? Here are 17 fun and romantic ideas for you to try. 1. 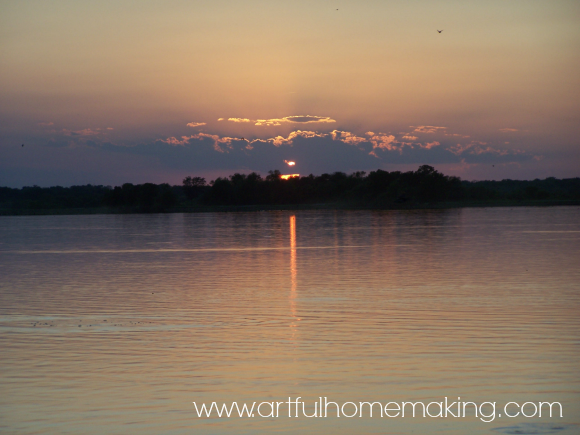 Go to a conservation area and just enjoy the beauty of God’s creation. Bring your own food if you’ll be there during a meal time. Be sure to catch the sunset if possible! 2. Pop some popcorn and watch a movie at home. 3. Take a picnic to a park, lake, beach, or other free outdoor location. 4. Make a special meal for just the two of you and eat it by candlelight in your bedroom. 5. Make a special dessert and enjoy it together after the kids are in bed! 6. Spend the evening at the library together. 7. Give each other massages. 8. Look through your wedding photos and old love notes. Enjoy reminiscing about your early dating/engagement days. If you have a wedding video, watch it for some fun memories! 9. Play games together after the kids are in bed. 10. If you live in a city, go to a free concert or performance. 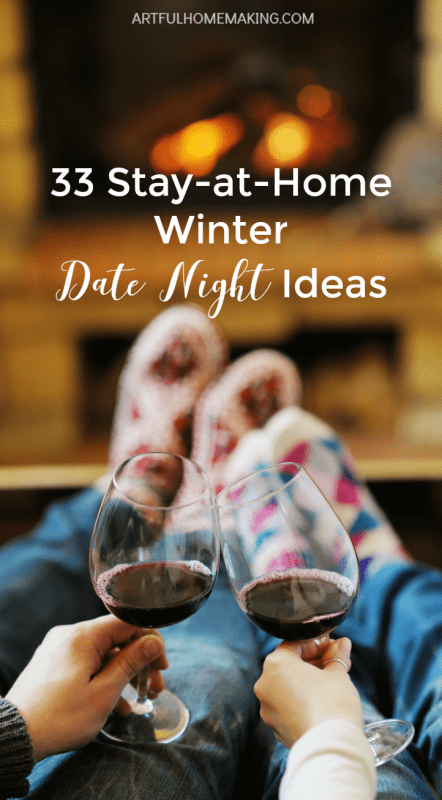 This has always been one of our favorite free date night ideas. 12.Visit your local nature center. 13. Go to a park and feed the geese and ducks. We used to walk to a neighborhood pond and feed the geese regularly during our early dating days. 14. Cook or bake something together. 15. Make some hot chocolate at home, then take it with you to drive around looking at Christmas lights. 16. Go camping in your backyard. 17. Plan your next vacation together. What are some of your favorite inexpensive or free date night ideas? Disclosure: This post contains affiliate links. Read my full disclosure policy here. Sharing here. My husband and I recently went on a date foraging for wild plums. On a separate night we made wild plum jelly to give as gifts this Christmas. One of the best dates ever. We have also gone hunting and fishing. Perfect dates. Amanda, your dates sound wonderful! I love that you made wild plum jelly together after foraging for the plums–very creative and special! This reminds me of our dates. We don't get a chance to go without the kids much but when it happens we usually just go grab some ice cream and bring it home. One of my favorite "dates" was a few years back when the kids were smaller. It was late when we got home and they had fell asleep in the car. The crickets were singing and it was such a peaceful night out. We live out in the country so the stars were bright and nothing but nature sounds. We opened the windows and the back hatch & let the kids sleep. We sat on the front porch and talked all night long. Talked about things we usually don't bring up because life is so hectic that they really don't seem important. Next thing we knew the sun was starting to rise and so were the kids. We were both tired throughout the next day but it was well worth it to have that time to talk & dream & reflect on everything. Its a favorite memory for us! So simple but so special! Wow, what a special date memory, Julie! That was beautiful–thanks so much for sharing!